The Hazelwood Village subdivision is a new home community in South Boise, ID. Enjoy a swim in a resort quality pool, throw a grand event in the Sun Valley inspired clubhouse, listen to smooth Jazz at an outdoor concert – all right where you live. Homes for sale in Hazelwood Village are located in the center of the Treasure Valley – so all the great reasons to live here just got easier to get to. 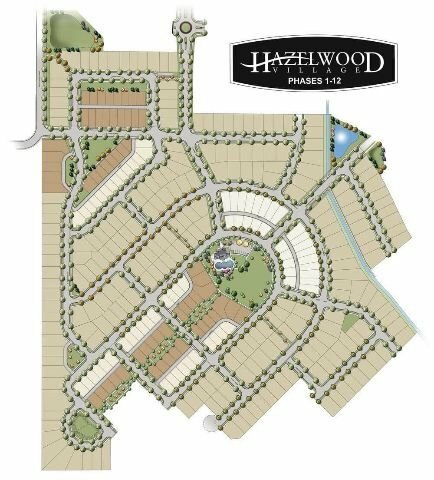 Read more about Hazelwood Village Real Estate below. Looking for new homes in Boise? Browse our complete guide to new subdivisions in Boise ID and find the perfect place to call home. Hazelwood Village homes for sale include both traditional lots and “alley access” building lots, each with a variety of sizes and configurations. Traditional Lots - 50′ to 70′ wide lots which are 110′ deep. The garage is in the front of the house allowing for a sizeable backyard. Alley Access Lots - Access to the garage is via private alley located behind the home. Alley Access lots in Hazelwood Village include an outdoor living area on one side of the property, allowing you to use all of the outdoor space between your patio and the neighbors. Known For: Large central one-acre park with an amphitheater for summer concerts, and events. Homesites: 608 building lots ranging in size from 0.07 acres (3,050 Sq. Ft.) up to 0.25 acres (10,900 Sq. Ft.). From W Lake Hazel Rd and S Eagle Rd, head East on Lake Hazel. Turn right (south) on S Almira Way. Don’t miss out on the newest Hazelwood Village real estate for sale. Contact us online or call our Boise new construction specialists at (208) 391-4466 today.